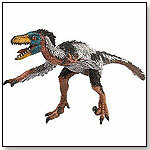 TDmonthly® - New Toys and Games: Soft Play 19" Velociraptor from BULLYLAND TOYS INC.
Other products from BULLYLAND TOYS INC. This collectible figurine is of a prehistoric Velociraptor. 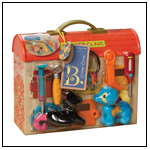 Bullyland Soft Play figurines are made to feel like the real thing with realistic handpainted details. They are great for pretend play and wipe clean with a damp cloth. They are made on a 1:8 scale from PVC & phthalate free synthetic rubber.